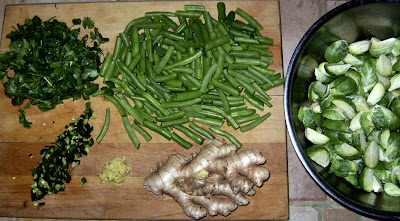 Spontaneous dinner for hippies, part two: this recipe is a twist on one of our favorites from The Ayurvedic Cookbook, green bean bhaji. We've added brussels sprouts because we're obsessed with them and they really add the complexity to elevate this weeknight bhaji to company-worthiness. This bhaji is an especially good option because if you serve green beans over brown rice, you're all set for protein--no bean-soaking, no tofu-marinating. It's tasty and very spicy; if you want less heat, you can remove the seeds from the chile, or, for the severely spice-phobic, maybe even use only half a chile. Heat the oil over high heat in a large frying pan or wok. Add mustard seeds; when they start popping, add asafetida and turmeric. 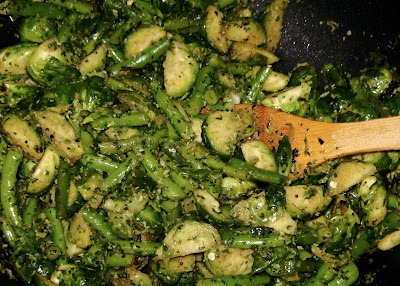 Stir quickly, then toss in green beans and brussels sprouts and mix to coat with spices and oil. Saute until beans are just tender and brussels are starting to brown, about 10 minutes. Meanwhile, combine water, salt, ginger, chile, cilantro and coconut in a food processor and pulse until you have a paste. Add to the vegetables and mix well, then saute for a minute or two. Serve with some rice or yogurt to soak up the heat. This weekend, four of our hardy bike-travelling friends came over for an impromptu dinner. What to feed these ravenous gardening folk with sensitive dietary needs (vegetarian, gluten-free, no corn and no refined sugar)? We settled on a spicy brussel sprout-green bean bhaji, whole fingerling potatoes in a tamarind-tomato gravy and a sweet-hot lemon preserve, all over a brown rice-red quinoa pilaf. We'll give you all the recipes over the next few days; to start with, today's post is about the fingerling potatoes. We also wanted to make a special dessert that gluten-free folks can't usually enjoy -- dark chocolate brownies tarted up with ganache and peanut butter to look like gooey petit-fours. But how to make brownies without flour, sugar, or glutenous substitutes like malted barley? We're not going to tell you yet, because this batch was a B- at best. The chocolate flavor was strong, but the texture called to mind garbanzo beans and potatoes, which is exactly what gluten-free flour is made of. Not quite bloggable, but we haven't given up yet. Hey, at least it looks cute. Heat about 8 cups of water (enough to cover your potatoes) in a large pot. Add the potatoes once the water begins to boil and cook until they are just barely tender (they'll cook more later). Drain and set aside. Blend the tomatoes, tomato paste, lemon juice, cayenne, turmeric, fenugreek and tamarind together in a food processor. Heat the butter in a large pan on medium heat until melted, then add mustard seeds. When the mustard seeds begin to pop, add the onion and garlic. Cook the onion for 5 minutes until starting to soften, then add the tomato mixture. Allow the tomato mixture to simmer for a few moments before adding the potatoes. Stir the potatoes to coat well, then add a cup of water. Turn the heat to low and allow the potatoes to simmer uncovered, stirring occasionally, until the tomato mixture has cooked down to a saucy consistency. Add salt to taste (which might be none, depending on how salty your tomato paste is). Note #1: If you want to make a brown rice-red quinoa pilaf, rinse 1 and 1/2 cups brown rice and 1/2 cup red quinoa in a strainer. Boil 4 and 1/4 cups water, add rice and quinoa, and simmer about 45 minutes until liquid is absorbed. Note #2: If you're feeling decadent, one of our dinner guests opined that these potatoes would be even more delicious if they were roasted in olive oil instead of boiled. Next time! The first time I lived alone in Manhattan I bought onions. I diced five of them before I realized that I no longer lived with Hannah. It took a while to get out of the habit of cooking in bulk, and I thought I was alone with this problem of overcooking, until I mentioned it to Sarah. When Sarah lived in Germany she was only cooking for herself. Every night, she asked her roommate what she was having for dinner (usually canned peas) and incorporated that into her meal, just so she should cook for someone other than herself. We both have made scrambled tofu for our carnivorous parents. 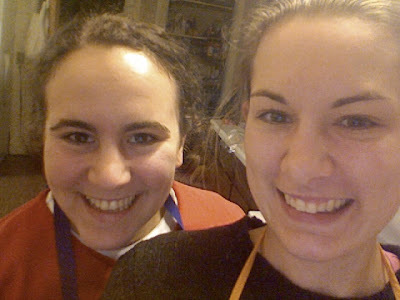 We both have a strong association with the smell of ground cumin and tonight we're reliving our past as cooking partners in Somerville, MA. Now we're both together in Somerville and Sarah has acquired a large canvas bag of root vegetables and is slowly converting them into vegetable soup, all the way pressing things under my nose to inhale -freshly minced ginger, ground nutmeg, freshly cut squash, C. Moore's Northampton honey, chamomile & mint tea and most recently, curry powder (don't breathe in too deeply). Now that she's headed home tomorrow for Thanksgiving, she's decided to convert this pile of orange veg into...... Beta Carotene Curry. If the phrase "brussels sprouts" triggers your gag reflex, you're probably remembering freezer-burned, over-boiled mush-balls. Fresh brussels, cooked properly, are so delicious that they get munched up before they even make it to the dinner table. We've included two great introductions to brussels sprouts -- a light stir-fry and a greasy, crispy roast. Heat olive oil in a wok or large skillet over medium-high heat. Add in brussels sprouts and walnuts, stirring 3-5 minutes, until sprouts begin to be tinged with brown. Toss in kale and saute until wilted. Season to taste with salt. Preheat oven to 375. Cut an "X" across the tops of the brussels sprouts as shown above, then transfer to a cookie sheet, toss with olive oil and salt, and roast until browned, about 40-45 minutes. Meanwhile, peel and dice the sweet potatoes into 1-inch cubes. 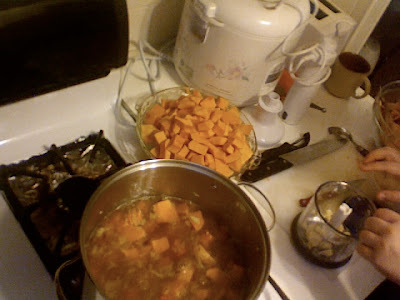 Bring a large pot of water to boil, add sweet potatoes, and boil until soft. Drain, transfer to a large bowl and mash with butter, ginger, lime juice and lime zest. Two fruit happenings inspired this crisp: we both came home from the office with free persimmons from co-workers' trees, and we found last year's bag of cranberries in the freezer while cleaning it out in anticipation of Thanksgiving. 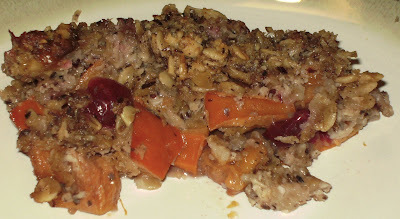 Phoebe came up with this dessert to combine the two, and the sweetness of ripe persimmons plays beautifully off the tart cranberries. A note about the topping: we found a jar of ground-up filberts left over from an attempt at Passover-friendly cookies (again:we were cleaning house), but if your pantry is a little less bizarre than ours, you could just grind some almonds in a food processor until they turn into almond meal. Or just buy the almond meal ready-made at Trader Joe's. Preheat oven to 375. 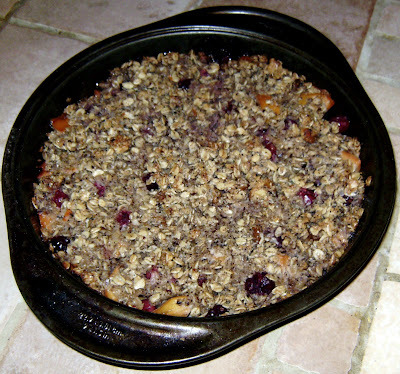 Grease a round cake pan and add the fruit, then drizzle with 1 tablespoon of the agave or maple syrup. In a medium-sized bowl, combine oats, filbert meal, chopped walnuts, melted butter or Earth Balance, the remaining tablespoon of agave or maple syrup, cinnamon, vanilla and salt. Sprinkle topping over the fruit, cover pan with foil, and bake for 45 minutes. Uncover and bake for 5 more minutes, until topping is browned. Mushroom-barley soup is great for breakfast on cold mornings, but sometimes soup is more of a sit-down meal than I can swing before 7 a.m.--I need something that can be gobbled down quickly if I'm running late. Enter this liquid-less, savory mixture, which is essentially kasha varnishkes without the bowtie pasta. I made a big batch tonight and will be gleefully chipping away at it all week. 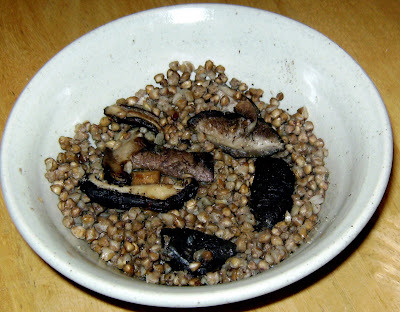 Roasted buckwheat, or kasha, is actually both wheat-free and gluten-free. Kasha is usually found in the "international" aisle (ha!) with the kosher food; you can usually locate a box of Wolff's kasha adjacent to those disturbing jars of jelly-coated gefilte fish, but Bob's Red Mill apparently caught wind of the hippie kasha market and has started selling it alongside their other grains and flours. This particular batch was made with whole kasha; some packaged kasha is fine-grain, in which case the proportions are the same but it will need less simmering time, probably about 3-5 minutes. Heat butter, oil or Earth Balance on high in a saucepan. Add mushrooms and stir frequently, until browned. Pour in water or stock and bring to a boil. While you're waiting for the liquid to boil, combine kasha with egg, stirring to coat all the kernels. In a heavy cast-iron skillet, toast the egg-coated kasha over high heat for 2-3 minutes, until kernels are separated. Pour in liquid and mushrooms, cover tightly and simmer for 10 minutes, until liquid is absorbed. 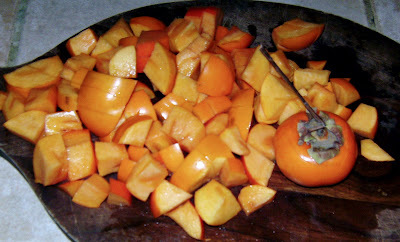 Season with Bragg's or tamari and pepper to taste. I've been traveling for the last week and a half, and on my flight home (yay JetBlue!) I watched 6 straight hours of the Food Network, all Thanksgiving-themed, which really got me in the mood for pumpkin pie. Our moist version combines traditional elements with cardamom and coconut milk, and the honey-caramelized walnuts add a delicious textural contrast. (The plan was to have them cover the top, but we ate a few while the pie was baking and...well, you can see how that ended). Preheat oven to 375. In a large bowl, stir together pumpkin, eggs, agave, coconut milk, salt and spices. Pour into the crust and bake for 10 minutes, then turn the oven down to 350. Once the pie has been in for 50 minutes total, start the caramel! To make caramel, microwave the honey-water mixture in one-minute increments, stopping between increments to check if it's the right consistency yet. To check the consistency, drop a little of the mixture into a glass of cold water--when it forms a soft ball, it's caramel. (This usually takes around five minutes in the microwave.) Add the butter, stir quickly and add to walnuts, stirring to coat. 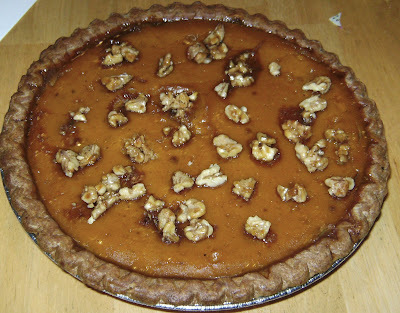 Sprinkle caramelized walnuts on top of the pie and bake for 10-15 more minutes, until the pie center stays firm when you gently jiggle the pan from side to side. (Total cooking time - about 1 hour 10 minutes) Allow the pie to cool to room temperature, which will give it time to firm up. Eat alone or with your creamy frozen treat of choice.